GREENFIELD — First went Justin Costa from the Center for Self Reliance, then Mary McClintock of Community Action, followed by Elizabeth Bienz from ServiceNet. They talked about issues of homelessness in Franklin County, root causes, continued problems, hopeful solutions. 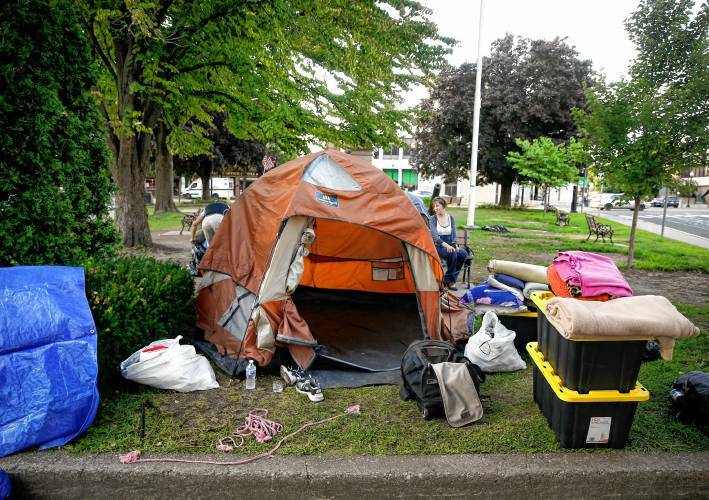 Then stepped forward the final voice on the panel, Madelynn Malloy, the impromptu spokeswoman of the close to 20 people who lived on the Greenfield Common for about six weeks this summer before being told by City Hall to leave. The forum was held by the Interfaith Council of Franklin County, gathering close to 50 people Wednesday evening at the Saints James and Andrew Episcopal Church. Those in attendance Wednesday overwhelmingly agreed that the issue of housing needs to be readily addressed, along with assistance through a concerted political pressure and a focus on transportation. A sub-group of the the Interfaith Council may be formed around one or all of these concerns with the overall goal of better coming together to advance the conversation on homelessness and what residents with homes can do to help. President of the Interfaith Council of Franklin County Kate Stevens implored those in the packed room to consider what they can do to find tangible answers to help people who find themselves homeless. While Malloy’s words were held in the highest esteem by most in attendance, often referenced in the discussion that followed, the social service workers who spoke earlier also shared a handful of ideas that were widely agreed upon. “Franklin County is somewhat unique in our region in that we don’t have as many organizations developing affordable housing,” said McClintock, the community collaboration coordinator for Community Action of Pioneer Valley. She did note the work the Mayor’s Office has been doing, spearheaded by Community Development Director MJ Adams. There were questions to what kind of housing is needed, how much of it and, most importantly people said, how to get it. There needs to be more single-room occupancy (SRO) apartments, easier access to redeeming a Section 8 housing voucher, more jobs to meet cost of living and longer term solutions that work at the root causes of homelessness, McClintock said. Bienz, ServiceNet’s program director for the Wells Street facility’s resource center, offered a few points she and her peers have seen as contributing factors: access to transportation, affordable child care and the ability to rent from landlords who don’t turn down people because of their history. She said it could be good to reach out to landlords and speak to them about potential incentives for giving chances for people who have been homeless. During Malloy’s telling of her own story, she shared a story she has often told to media and local politicians: working a well-paid job, having her own personal problems, a 3 a.m. fire, a life out of a hotel and the eventual slide to homelessness, which went from sleeping out of a car to different encampments around town to the Common, where at a time earlier this summer, was seen as legal. She said it’s not pleasant to live in the ServiceNet shelter, and at times she’d prefer to live out of a tent, but for now she is remaining at the homeless shelter. She said she hopes to find housing, but isn’t sure what the next steps are and if those steps are even plausible. In the meantime, she attended the forum to explain for what she is advocating.